Ernest Shelton, 2010. Located at Venice High School, Venice Boulevard, Venice, California. 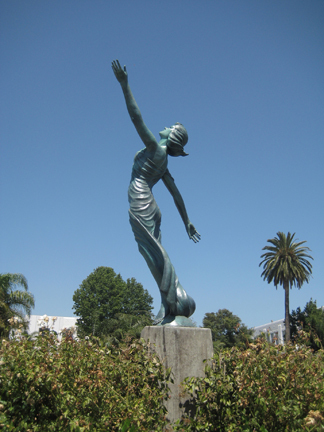 Text from the plaque: The original statue "Inspiration" was unveiled on this site in 1922 where it became the symbol of Venice High School. and the Venice community. Sculptor Harry Weinbrenner, Art Department Chairman used a shy young student, Myrna Williams, as his model. With the start of her motion picture career this shy student later became known as Myrna Loy. The statue was repaired by William Van Orden twice during the 1980s and has been exhibited in this location until its deterioration required removal in 2000. This re-creation was completed through the generosity and hard work of Peter Schwab, '61, Laura Ferre '76, the Venice High Alumni Association, countless VHS Alumni and the Venice community. This beautiful re-creation has been sculpted by Ernest Shelton. Dedicated and celebrated April 10, 2010.